A great choice for applications using powders, liquids and granulated materials. 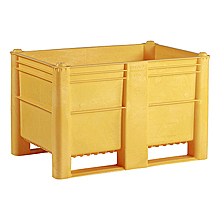 Made from USDA and HACCP approved materials, these heavy-duty box pallets handle everything from meat processing to produce bulk storage and liquid chemical mixing. Each container is a one-piece injection molded unit, making the runners more substantial and durable to impact and abuse. Resistant to corrosion, UV light and chemicals, these bins hold up to a wide range of temperatures including steam sterilization and high-pressure wash down.